used. These rules, for instance, do not count the (optional) newline at the end of a one-line program. The Concrete Perl programs work on all standard versions of Perl 5.8.0 and have been verified as 32 characters long using a count program. These programs are also written to work and to be visually pleasing on terminal windows (or terminals) of any geometry. mode if the resolution of the display is not particularly high, you may wish to decrease the font size a notch in each window. Concrete Perl was released onto the demoscene and discussed by me for the first time in my talk “Beyond Data-Driven Poetry: ppg256 and Concrete Perl,” on the panel “Literary Practice and the Digital Humanities, Redux: Data as/and Poetry,” Digital Humanities 2011, Stanford, June 22, 2011. 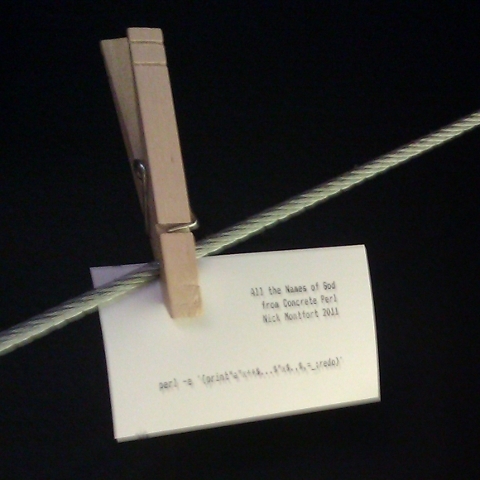 I have printed the four programs/poems on a dot matrix printer on business cards and am handing them out and, in some cases, adding them to the “Interactive Poetry Wall” at Stanford University’s “Coho” coffeehouse. I went by to OLPC (One Laptop Per Child, the nonprofit that has created and deployed worldwide the green laptop for kids) yesterday for some discussion of narrative interfaces. I explained the basics of Curveship and what was interesting about it from my perspective, mentioning that one could hook the narrating engine up to something other than an interactive fiction world. I also found out that others had some of their own, very interesting, ideas. Source is available on github. 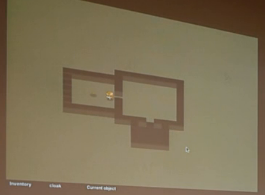 While it doesn’t generalize to every Curveship game, what it presents on the screen here is done without any additional game data: Chris’s system determine that the south room is dark and obscures it, determines where the exits are, places objects in rooms, and generates rooms of random size since there is no way to determine how big or small a room is. The only thing the systems knows about the underlying simulated world is what’s in fiction/cloak.py, the file I put together to demonstrate Cloak of Darkness in the usual textual interface. On the one hand, it more or less discards all of the work that fascinates me the most, the text generation and narrative variation part of the system (*). But on the other, it’s the most radical narrative variation yet – replacing the textual interface with a graphical one. A pretty neat twist on the system, and one which is very interesting from a research standpoint if one’s interested in comparing image and text in narratives. I hope work on this will continue and that we’ll find other mutually beneficial ways to connect Curveship with the OLPC project. (*) It doesn’t really discard these or truly “replace” the text channel. You also get to read the textual description of rooms and the textual representation of actions in windows as you play the game. But it makes the main interface a GUI rather than a textual exchange. A new issue of Game Studies, the pioneering open-access journal that deals with computer and video games, is out. Of particular note – to me, at least – is that among this issues eight book reviews are two reviews of the book I wrote with Ian Bogost, Racing the Beam. The two reviews are “Hackers, History, and Game Design: What Racing the Beam Is Not” by José P. Zagal and “The fun is back!” by Lars Konzack. I’m very pleased, as Ian is, to read these critics’ resposes to our book. Thanks to Carlos León, there is now a Spanish version, “Los Dos,” of my simple but (I think) provocative story generator “The Two.” The system was previously translated into French as “Les Deux” by Serge Bouchardon. The reader who takes the time to try to actually understand the output and resolve the pronouns in it will see that often this task is complicated by ambiguity in gender, although syntax and power relations also work to suggest certain ways that pronouns can be resolved. The need to leave the gender of the characters indeterminate in the first line posed particular problems, and slightly different problems, for the French and Spanish translators, who each found a solution.